Do you wanna see my paintings? When FLAM’s curatorial team met the Polish hairdresser Beati Jolanda Niesyta in a dance course for non-professionals in Amsterdam, they were immediately taken by her charisma. Beati enthusiastically proposed to exhibit the small paintings she makes in her free time during FLAM. 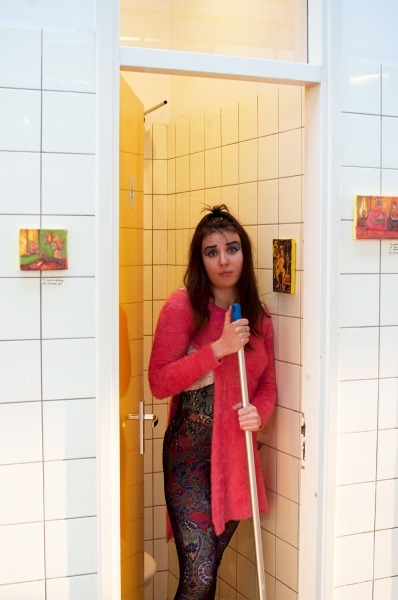 By exhibiting them in the toilets of Arti et Amicitiae and Frascati, she hopes to make the restroom “a more pleasant place”. While guarding her paintings at a little table, Niesyta will converse with visitors, telling them eagerly about the narratives and events that inspired her to create these works. She incidentally also proposed to keep the toilets clean. FLAM has therefore equipped her with the necessary cleaning tools and materials.